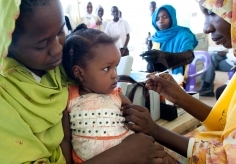 Routine childhood vaccination is among the most cost-effective, successful public health interventions available. Amid substantial investments to expand vaccine delivery throughout Africa and strengthen administrative reporting systems, most countries still require robust measures of local routine vaccine coverage and changes in geographical inequalities over time. This analysis drew from 183 surveys done between 2000 and 2016, including data from 881,268 children in 49 African countries. We used a Bayesian geostatistical model calibrated to results from the Global Burden of Diseases, Injuries, and Risk Factors Study 2017, to produce annual estimates with high spatial resolution (5 × 5 km) of diphtheria-pertussis-tetanus (DPT) vaccine coverage and dropout for children aged 12–23 months in 52 African countries from 2000 to 2016. Estimated third-dose (DPT3) coverage increased in 72.3% (95% uncertainty interval [UI] 64.6–80.3) of second-level administrative units in Africa from 2000 to 2016, but substantial geographical inequalities in DPT coverage remained across and within African countries. In 2016, DPT3 coverage at the second administrative (i.e., district) level varied by more than 25% in 29 of 52 countries, with only two (Morocco and Rwanda) of 52 countries meeting the Global Vaccine Action Plan target of 80% DPT3 coverage or higher in all second-level administrative units with high confidence (posterior probability ≥ 95%). 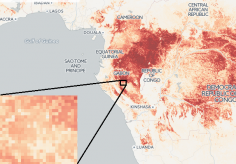 Large areas of low DPT3 coverage (≤ 50%) were identified in the Sahel, Somalia, eastern Ethiopia, and Angola. Low first-dose (DPT1) coverage (≤ 50%) and high relative dropout (≥ 30%) together drove low DPT3 coverage across the Sahel, Somalia, eastern Ethiopia, Guinea, and Angola. Despite substantial progress in Africa, marked national and subnational inequalities in DPT coverage persist throughout the continent. 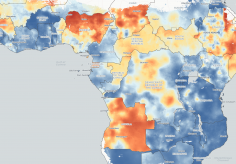 These results can help identify areas of low coverage and vaccine delivery system vulnerabilities and can ultimately support more precise targeting of resources to improve vaccine coverage and health outcomes for African children.